Beetroot salad was always prepared using the red beets, but the golden sort isn't bleeding as strong and you won't have to wear rubber gloves when peeling and cutting them. 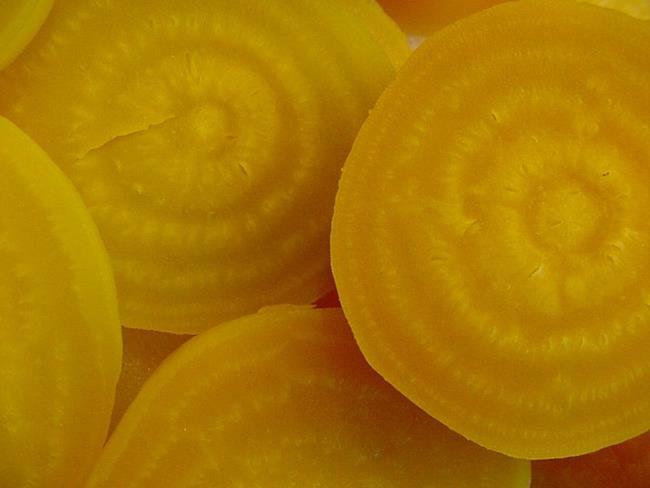 For 3-4 portions boil 4 golden beets (as is, please! Don't peel it, don't cut the ends), about 50 minutes. Find out if done using a knife - remembering the potato thing. Pour away the water immediately, put the steaming beets on a working surface, let them cool down a bit for 2 minutes and start to peel the beets. The easiest way is to use your both thumbs: just rub the peel off (use caution, too! It's hothothot, rubber gloves can help) and the tiny tail, too, cut off the other end. If you've survived this without raising blisters, take a sharp knife and slice the veggies, about 4-5 mm thick. After finishing the slicing, start the sticky part: laying the slices flat, cutting them into sticks/strips. Same size - 4 -5 mm! Put all the guys into a salad bowl, cut a shallot in the smallest cubes you are able to, add it to the beets and, as long as they are warm - sprinkle white balsamic vinegar over it (if not handy, take unseasoned rice vinegar or apple cider vinegar), season with salt and fresh ground white! pepper, let stand for 5 minutes (pet your cat, kid, hubby or clean the working board), then finish with a fair amount of grapeseed oil. Cover it, let it cool down and place it in the fridge for a cool overnight stay. The next day it will taste devine. It's wonderful in combination with oven baked potatoes and some feta cheese or - even better - with a real good farmers rye bread and a liver paté. SONY Mavica F90, resized from 1472x1104 to 800x600 pixels.